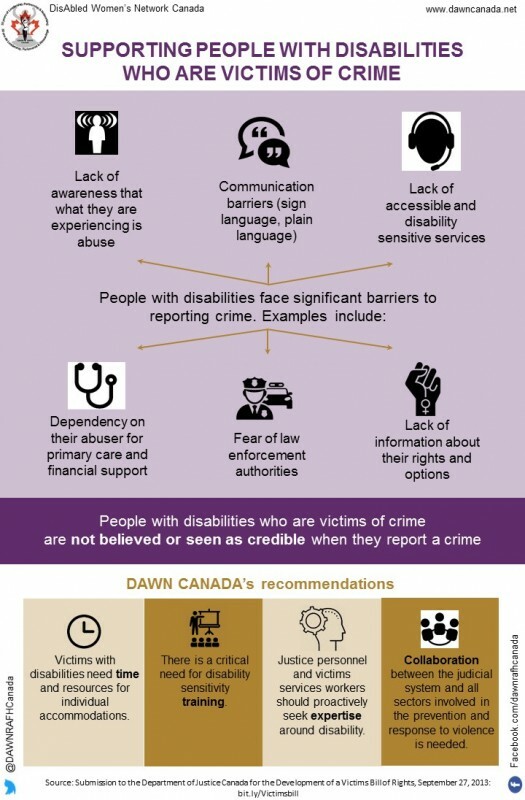 In September 2013, DAWN Canada prepared a series of recommendations for the inclusion of people with disabilities in The Victims Bill of Rights. Our recommendations are based on years of work done by disability activists/leaders who have been fighting to ensure greater protections and supports for individual victims of crime who also live with a disability as they try and negotiate the judicial system. Emphasis is placed on seeing the person first and not the disability. Thus the starting point is to recognize that in this context, the person with a disability is a victim first – who might need differential types of supports to ensure that their rights are protected, yet has the same needs as all victims. During Victims of Crime Week, May 27-June 3 2017, we ask you to share our info graphic which summarizes our key recommendations in support of people with disabilities who are victims of crime.